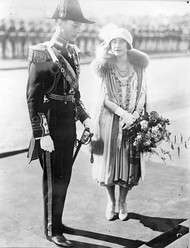 Royal Visit May 1927. 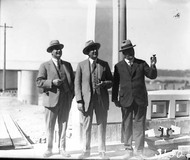 Prime Minister Rt Hon S M Bruce welcoming the Duke and Duchess of York, on the steps of Parliament House. 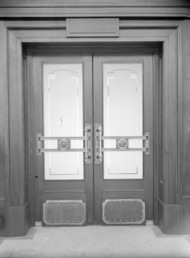 Doors to the House of Representatives chamber. Parliament House. Back stairs and interior. 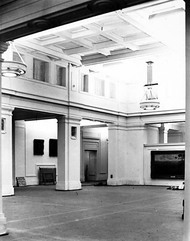 Parliament House - House of Representatives chamber under construction. Parliament House from north east. 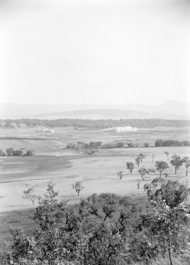 Parliament House from south west (Camp Hill). Speaker's Chair, House of Representatives, Parliament House. 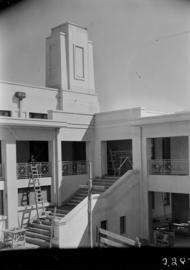 Pot plants being hoisted on to the roof of Parliament House. Anzac Day, 1927. 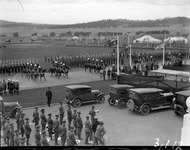 Parade passing Parliament House. 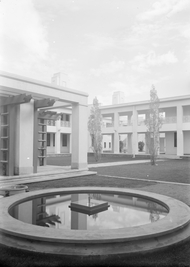 Fountain and courtyard in Parliament House. 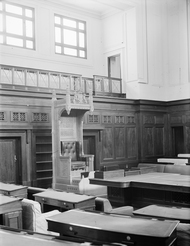 Speakers Room, Parliament House. The bed folded into the cupboard directly behind it. Newspaper benches in Parliament House Library. Royal Visit, May 1927. 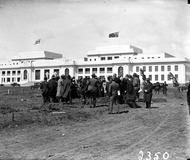 Canberra citizens passing the Royal Party on the front steps of Parliament House at the Civic Reception. Royal Visit, May 1927. Casket and Gold Key of Parliament House. Royal Visit, May 1927. Duke and Duchess of York arrive at Parliament House in an open carriage. Royal Visit, May 1927. 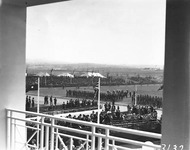 View from front of Parliament House looking east at troops, band, spectator stands and tents. Mount Pleasant in background. 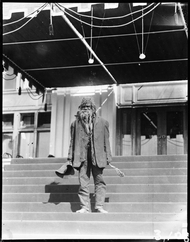 Jimmy Clements (also known as Yangar or Nangar and ‘King Billy’) on the front steps of Parliament House. c.10 May 1927. Parliament House, interior of King's Hall with statue of King George V.